A family is celebrating after being named the winner of Stirling’s first Reindeer Trail. Karin Schiller and her eight-year-old son Werner won an iPad after successfully completing the popular initiative in the run up to Christmas. Their entry was the first to be picked at random from more than 1,000 correct competition forms. 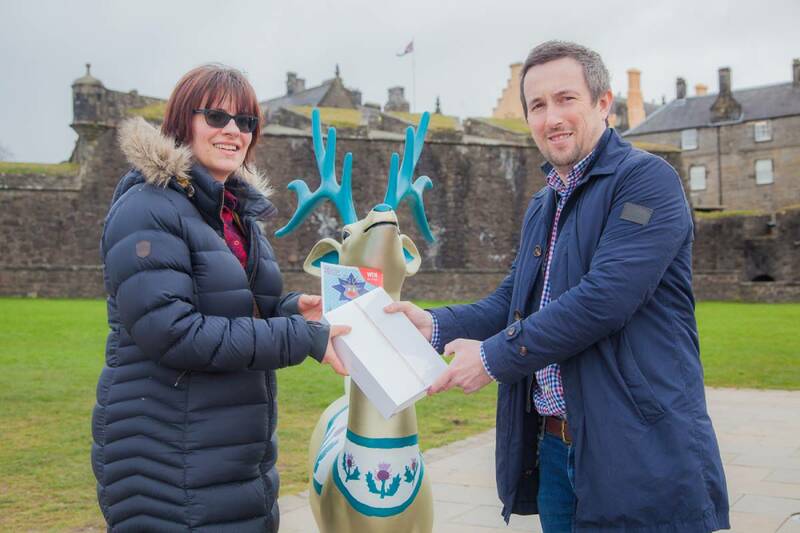 Karin was presented with an iPad by Andrew Mitchell, Chairman of Go Forth Stirling, the city’s Business Improvement District, which organised the Stirling Reindeer Trail. “The Trail was a great idea and it was wonderful to see children getting out and about to explore Stirling. “It was good fun finding the reindeer in the various shops and we even picked up some Christmas presents along the way. The inaugural Reindeer Trail was held during the 2018 festive season in a bid to increase footfall and circulation around Stirling city centre as well as create a fun and festive atmosphere for shoppers. A herd of 20 life-size reindeer were designed and decorated by local schoolchildren before being given pride of place in shops and cafes. Shoppers were encouraged to pick up a map complete with clues and find all the reindeer in a competition which could win them an iPad. There were 2,000 entries for the contest with the winners picked at random from 1,241 correct and fully completed forms. The popularity of the Stirling Reindeer Trail exceeded the Board’s expectations and we’re happy with just how popular it proved with local families and the traders who took part. In addition to the main winner, five runners-up are due to receive a series of prizes including a trip to Stirling Castle. They are Ffion Roberts, from Stirling, who won a day pass to Stirling Castle; Morag Miller, from Airth, who won a tour of Stirling Old Town Jail; Amy Newhouse, from Bannockburn, who won a game at AMF Bowling Stirling; Gillian Cavin, from Dunblane, who won a gift card for the Vue Cinema and Lisa Main, from Doune, who won tickets to visit the Wallace Monument. Meanwhile, the reindeer have returned to their secret location but will be back for a second Stirling Reindeer Trail featuring new themes this winter. Published by Blackburn Communications on March 22, 2019. Photo by Janie Meikle Bland. As featured in the Stirling Observer and Primary Times online.